Buck and Nancy were the youth group advisors at church during my Senior High years. They were both teachers. Buck, who’d done a stint with the Marine Corps as an officer in Vietnam, taught high school biology and Nancy taught in an elementary school. They were young and full of energy. We had a small youth program, a dozen or so students, but it was a tight knit group. We spent a weekend painting the youth room. The walls were blocked and we painted each block by hand: green, blue or yellow, in diagonal strips that ran up the walls. Then we went back and outline each block, painting the mortar black. When we were done, it was very psychedelic and very 70s! We met in that room every Sunday evening and once a year we’d take a weekend trip to Camp Kirkwood, which was always highlighted by a day-long canoe trip on the Black River. The water was high and fast that early spring day in 1973. Or maybe it was late winter as the trees were still bare. Whenever we reached a bend in the river, water continue to flow straight, cutting through the swampy side of the river, making it difficult to navigate our canoes as the water pushed you out of the main channel. We struggled and paddled hard, especially at the bends and in the shoots through blow downs, where the force of water threatened to push us into trees that had fallen into the river. Buck and Nancy paddled up and down the line of canoes, offering suggestions and encouragement, trying to keep everyone together and dry. Most of the canoes had two paddlers, but there was one boat with three people. Billy, who always marched to his own drum and never worried about what others said about him, sat in the middle as Marge and Rosa paddled from the bow and stern. At one point, Buck was yelling for everyone to stop and Billy, thinking he would be helpful, reached up and grabbed a branch of a tree to hold the boat. His choice of branches wasn’t the best as it was rotted and a fell across the canoe. Luckily, they didn’t capsize. Seeing this large branch straddle the canoe, like out-riggers, gave us all a laugh. At lunch, on a high bluff overlooking a bend in the river, clouds began to come in and the temperature cooled. Buck hurried us on, saying we might be getting some rain. But it never did rain that day and by mid-afternoon, we were pulling our canoes out and loading them on the trailer for the trip back to Camp Kirkwood. This was my first river canoe trip. I’d paddled a canoe on a lake at scout camp, but there was something about the river where every bend held new possibilities of seeing wildlife. The Black River gets its name from the dark water that’s stained by the tannin acid from the cypress and juniper that grow in the swamps around the river. Although I didn’t know it at the time, we’d canoed through swamps that contained some of the oldest trees in the Eastern United States. One tree there is over 1700 years old. But that didn’t matter, I was hooked. Not long after this trip, I began working at Wilson’s Supermarket and immediately started looking at canoes and saving some money. My dad suggested that before buying a new canoe I put an ad in the classified section of the Star News. It was a simple advertisement, “Wanted: A Canoe” and included our phone number. A few days later, while I was at school, a man from Southport called and left me a message. I called him back and in a day or two, my father drove me over to look at his Grumman Canoe. The man was moving and needed to sell it and offered it to me for $60. At this time, a new would have cost me nearly $400. I brought it and we tied it to the top of my father’s car and drove home, stopping along the way to buy paddles and life jackets. Over the next ten years, I got more than my money’s worth out of the canoe. That $60 investment was the best I’ve ever made as it provided me over a decade of explorations all over North Carolina, and into Tennessee and Virginia. But mostly I used it to paddle the black water swamps of Eastern North Carolina. 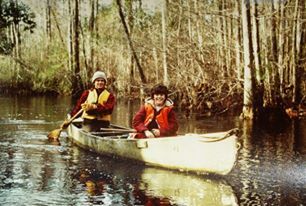 I was heartbroken in 1985, when I came home from the National Jamboree of the Boy Scouts of America to discover that during my absence, someone had stolen my canoe. However, the “replacement cost rider” on my insurance (partly due to a decade of high inflation) paid me significantly more than what I’d originally paid for the canoe and I upgraded to a Mad River ABS boat (which I still have). 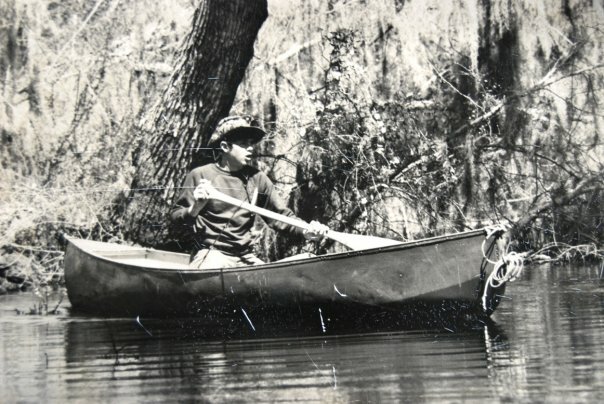 Hi Jeff, I too had a Canoe – it was an “Old Town Indian Canoe” 16ft. (narrow) with-Wooden stays Canvas covered. I bought it in Williamsport, Pa.in 1960 which was before I graduated High School 1961. So interesting to read about what sparked your interest in canoeing. Sorry your first canoe was stolen. Enjoyed seeing the pictures, too! So sorry your first canoe was stolen. I loved the photos. That’s impressive that you still have a canoe from 1985! Thanks for inviting me to your blog! You have a fascinatingly rich history and life, Sage. I see determination on that young boy’s face. It’s a nice glimpse into who you were and are. Wow, you certainly got your money’s worth from that first canoe. Plus it was an important beginning to what has become a lifelong past time for you. Glad to hear the insurance more than covered the loss of your original payment. I enjoyed reading this memory. The mystery man revealed, Sage! Thanks for inviting me here. I really enjoyed the story of your first river canoe trip. Somehow I was not surprised to learn you are a minister. 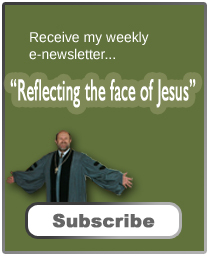 I think it was a post on John Knox that struck me. I’m in awe of how much writing you accomplish with all your responsibilities! Wishing you many more enjoyable river canoe rides. Nicely told – sad about your canoe (hard to wrap my brain round why someone would steal it), but it turned out well! I confess that the closest I’ve come to a canoe is on a pleasure lake as a child, but my son often kayaks on rivers in Wales and, I think, in the sea. An interesting read … thanks. Shame your first canoe was stolen, but the replacement worked out well. So nice to see the older photographs. Great stuff, just like over at sagecoveredhills! I guess you are “coming out” to all your friends and followers there! Seriously, thanks for inviting us all along! Wow I love that photo! I sure do wish I had some from when I was a child. Thank you for telling me this website. It looks great and I look forward to visiting in the future.